Introducing a SHOCKING Event in the Online Business World! Today we have a MAJOR announcement to make. We are officially rolling out our STARTER MEMBERSHIP at Wealthy Affiliate. Starter Membership Cost = $0! Starter Membership Length = FOREVER! You read that correctly. The cost to have a Starter Membership is $0. It includes full access to the WA community and there is no longer a "trial period"...it is forever! The Starter Membership is officially here and here to stay. Anyone and everyone that joins Wealthy Affiliate is instantly getting an awesome Starter membership. This is far more powerful than any other service out there, including all of the products and services that you are used to paying for. Where else can you find over 500 training modules on nearly every topic related to Online business? Where else can you build a website and have it up and running in literally just seconds? Where else can you build relationships, network, and get instant support for everything related to running an online business? Where else can you learn to build an online business without any up front costs? All of the paid products and services offering the "next shiny thing" are simply plaguing your inbox on a daily basis. They do not offer the value, tool set, services or support that our WA Starter membership offers. The Starter membership at Wealthy Affiliate provides this streamlined platform for everyone interested in earning revenue online. With the introduction of the Starter membership, Wealthy Affiliate is now a fully “open” and "collaborative" community dedicated to Internet business. This means that there is no 10-day trial period where a new member will lose access after 10 days. Every member with a starter account at Wealthy Affiliate and everyone who has been on the 10 day trial in the past, now have full access to the Starter level membership. This an opportunity to learn at their own pace and realize the massive benefit of being part of the Wealthy Affiliate community. There are 1000’s of new members every week that come to WA with little or no knowledge about the vast opportunities available online. Previously, the 10-day trial was just not enough time for someone to be able to start the initial Getting Started training. Now EVERYONE can. No time limits. No limits to when you can access. NOBODY ever gets cut-off. Now all members have an unlimited amount of time with their Starter membership to work through the initial training, familiarize themselves with the WA platform, build websites, create content, access the loads of training within WA, build relationships with others...and start their way through a very successful journey through the online business world. Wealthy Affiliate is your HOME BASE. Wealthy Affiliate your GO TO. Wealthy Affiliate is a SAFE HAVEN from scams. Wealthy Affiliate is the ONLY PLACE you will ever need if you are even remotely interested in creating a business online. Premium Level membership is in a league of its own - Nothing (absolutely nothing) online exists that can compete, or even remotely offer a platform at the same level. If you are a PREMIUM member or thinking of becoming a premium member, you have everything you need to grow and sustain a successful business within the online world. Premium members enjoy the most complete Online business platform available...PERIOD! With everything required to own and operate a fully optimized and profitable business. The Wealthy Affiliate Premium membership will take your knowledge to a level that few people in the online world possess, thus your business will stand in a league of it’s own as well. Live weekly video training, unlimited web hosting and website installations, access to premium courses, premium support, premium.. well premium everything. The Premium offering will continue to grow. Wealthy Affiliate as a community will continue to grow. The wheels are always turning behind the scenes and we are still yet to churn out some of our greatest innovations yet. THE BEST is still to come. So today, I would like to invite anyone back that was part of the 10 Day Trial. You now have full access to the Starter membership with no time restrictions. If you are not a member of the Wealthy Affiliate community yet, you can join in on the awesome community and claim your Starter membership RIGHT NOW. This is an exciting day for us. One we have been pushing towards for quite some time now and I can honestly say that there is sheer awesomeness in your future. So you mean I should close my Premium account (loosing blogging history, contacts network, rank, likes, etc etc) and re-subscribe for a Starter Membership from scratch? How can I downgrade from my Premium account to the starter Membership? At this point you can not do this. You would have to create a Starter account if you wanted to do this. I think you guys are great by offering a starter membership!! This is what i have been looking for all the time. Now i can work through a lot of stuff in my own time and i am sure that i will become a premium member initially, and i am sure that many others will feel the same about this and be just as exited as i am about this opportunity!! Thanks guys this just shows that you truly want to help people succeed online!! Yeah, most definitely. The time limit is something that everyone is happy we have removed and it is going to be gone forever!! Well spotted, I think it has "As low as $0.98" because if you pay for a full year it works out to that much. If they said "That's Only $1.51 per day" it doesn't look as good. Yes, you can get the WA premium membership as low as $0.98 per day if you join for the 1-year option. We have two options for the Premium membership which are Monthly at $47 and Yearly at $359 ($0.98 per day). Thank you! I just did not have enough time in my 10 day trial either. This is great! thank you! I was worried that I wouldn't have enough time in 10 days to give the system a chance. Yeah, now you have as much time as you need and I think you are going to realize the extreme value here within WA. Truly, this is the only place you need to be if you are interested in earning money in the online world. Don't let yourself get distracted by the next shiny object, everything you need is here! While I personally don't think the cost of the premium membership is high, it is still an expense. In closing, I came across a highly negative post about this website. Whether or not it's justified, I the fact it was not removed speaks volumes about the openness of this forum and the founder's credibility. Exactly and what you have said here validates many things that we were thinking. People should be joining based on how much they like our service versus on urgency alone. People didn't have 10 days to work (most people probably only had a few) and it was quite restrictive as to what someone would want to do when they were only given 10 days. I wanted to also chime in on what you have said here because you have really nailed it perfectly. There is a time and place to use time sensitivity in marketing, but taking away people's access to WA after only 10 days just did not make sense. For well over a year we have wanted to OPEN up WA and allow people to make their decisions about upgrading to Premium at their own pace. We wanted to wait until we had all the pieces in place so that the platform could handle the huge influx in users we will be getting. We are so excited to be 100% transparent with what Wealthy Affiliate is and it is Kyle and my goal to help every single member succeed online. Those who apply themselves will succeed. Since 2005 Wealthy Affiliate has been very highly regarded in the industry. We do not do these silly (and scam) promotions like so many others, actually we do everything in our power to distance WA from the GURU's of the Internet marketing industry. Now that WA is truly Open we can give people the time they need to build a trusting relationship with us. On the note about negativity.. there will always be people who are negative out there but we understand that. Rather than worry about a handful of negative remark, we like to focus on the Millions of positive ones :) WA is truly here to help people learn about online business and we look forward to the opportunity that is available now that the 10 day time limit has been lifted! Yeah, we were 100% aware of the issues John and it was just a matter of getting a few things into place in order to roll out the Starter membership here at WA. It has been a liberating feeling to get this done and we are excited about the community here at WA going forward. Man you guys keep raising the bar! This is great news. I always felt that the 10 days was a great start. But wasn't enough time to really apply what was being learned. And let's face it, in this economy it can be hard enough to pay your immediate bills let alone having enough for training ( that is totally worth every dime). You've made this accessible to everyone and gives folks the opportunity to apply what they learn to make enough money to pay for the premium membership and much more. Great job!!! Thanks Eddy, great to see you back here! It was our ultimate goal one day to be able to offer a wide open Starter membership, but it took some time and some things to fall into place to get there. 10 days simply was not enough and it was actually constricting people from doing anything at all (why would I join for 10 days if it is all going to be taken away from my afterwards). Wow! I am shocked! This is really great:) Way to go! Just wanted to take a minute to thank the fellas (here on WA) for all your hard work along with the family at WA..
You've made it to the right place if you're reading this post, this is where the rubber meets the road. Thanks for the exceptional support family, today's update was very refreshing and a perfect example of how WA delivers, I'm going premium without a doubt. You are more than welcome! This has been in the plans for a very long time and we are so excited about the opportunity now available to everyone who comes into WA. We absolutely hated closing the doors to people after only 10 days, however we needed to have the technology and system in place to handle a truly open community. We can now move forward with a number of monumental upgrades that have been in the works for months and in the idea bank for years! This is wonderful guys.........with my current financial situation I never know from day to day where the $ is going to come from to keep up with bills. Thank you!!! Honestly... I think this is truely the best option we have EVER offered. Time limits and busy schedules cause people to come, look, forget, and time expired. This will allow them to "Self Pace" much better as described above. Now.. that said, how will or what resources will Affiliates have at thier disposal to go about promoting the better premium option? PS. I'm glad Premium is back to $47 dollars too, instead of $97. ABSOLUTELY AWESOME! Thanks for the comment! You really said it well by saying that most people have busy schedules! We want to allow all members who come to WA to have a chance to get involved and learn. The more learning, the more succeeding, and that is our ultimate goal for all. Kyle do you have any plans to add banners or update the shout outs in the affiliate program section to reflect the new changes here or is it up to us to make our own? I see the shout outs are quite old and the tweet button underneath the has been disabled. We will be totally phasing out Shoutout...it doesn't make sense. You can share absolutely every piece of content here within WA through the share buttons (this adds your affiliate link automatically) and you can also click the Affiliate Link button within any post or training resource. And yes, we have plans to add banners. It has been less than 24 hours...trust me we are going to be on top of all these things (and a heck of a lot more)!! We have banners on the way David! The "shout out" system isn't really used any longer as all pages in WA can be shared. Lots of affiliate training and resources on the way. That is fantastic news guys! I can't wait to see what you have in store here. This is an epic and historic event here at Wealthy Affiliate! Glad I am part of this community that gives so much. How do we promote this? Do we just say that Wealthy Affiliate is free now? So: "It's free to join, you'll have access to all the training and can create up to 2 websites whenever you like"? You have access to any training that is not premium. Premium members can only access the premium training, the live weekly webinars, and all of the historic webinars. Kyle you guys never cease to amaze me. This platform continues to grow in leaps and bounds. If you are a starter member and feel like you are finally grasping the training, buy the annual membership and become a premium member. The additional access to training is well worth it. Well Kyle this is gteat news, you have made a lot of members very happy and that including me. What is the minimum age to join WA? For anyone who wants to promote WA is it ok that they or we can use the image you made above? Are you guys going to create new banners that WA members can place on their websites that will help us interest more people to this new roll out? I think it would be AWESOME if you guys can do it in a way that explains it quickly and easily. Either way, this is very exciting news!! What program did you use to create the pic, the list starter vs premium? This was done in house using Photoshop. Yeah, exactly. Now you don't have to let them know about it with a BUT "but you only get 10 days". Now you can just invite people to come join you within the community and utilize WA to start learning about online business, expand their existing business, etc. Thanks for the kind words and I do appreciate your feedback! Very Cool! I had a free one month membership when I first started. I do believe this helped with my membership registration. The Starter membership gives you enough to realize the true value of WA and does not pressure you to do things quick. Yeah, time makes a big difference. We all have busy lives and there is no way most people have 10 consecutive days they can apply to this. Now people have as much time as they like and as you validated, it makes a big difference in terms of pressure. People are rash and make irrational decisions when they have to "do stuff quick". We have now removed that for all newcomers and we are going to continue upping the ante for Premium members. Thanks for your feedback and personal insights! I was waiting for the 'April fools!' to kick in... then I checked the date. Looks like we're safe on this one! No April Fools joke here lol. That reminds me though, I should start planning out the one for this year. Yeah, that is a good one. The LIFETIME membership offer last year yielded some of the strangest requests. People were literally offering us their houses and vehicles in exchange for the lifetime membership! We will go to the drawing board in the early new year to see what we can come up with this year! Thanks Kyle! I was stressing about running out of time on my 10 day trial and now I can relax and study more completely on what I want to accomplish. You're the best! The stress should now officially be gone! Now you can take your time moving through the training which is going to lead to much greater accomplishments. All I will say is thank you, you are appreciated, I will see you at the next updated installment to WA and bye. Thanks for your feedback and hopefully we don't make you too crazy going forward!! Definitely going to make it an even easier sell on your website as there are no barriers to entry now (time was the last one). With an open ended free membership, is there a limited time window for which any referrals we make have to convert to Premium status to ensure we still earn a commission? e.g If I refer someone today, and they don't convert to Premium until 12 months time, is my referral still eligible for a commission? Is there a difference between premium member and platinum member...or is there a platinum member anymore? The difference as far as price is between $47 and $95! 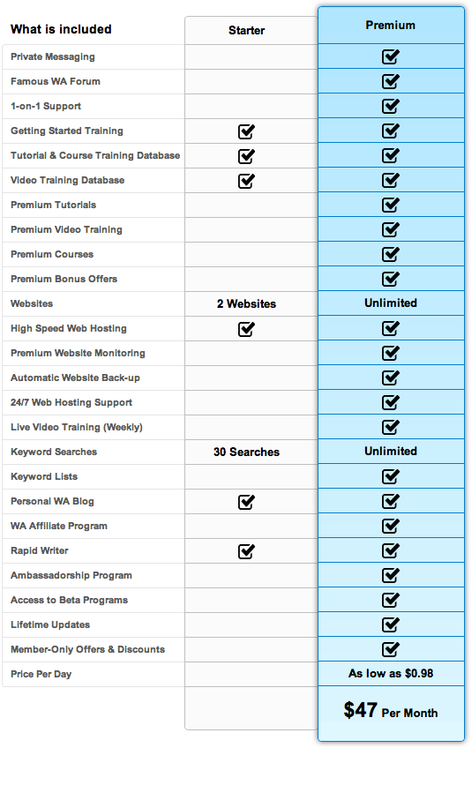 The Premium membership replaced the Platinum membership from the previous version of Wealthy Affiliate. We are currently offering the Premium membership here at WA for $47 per month. This is awesome news! I know it's difficult to find the time to learn for a lot of people just starting, especially if they work other 9 to 5 jobs. This way they can take the time to actually learn how and what they are doing and not feel pressured by having only a certain amount of days to do it in. Great job Kyle and Carson! I know that 30 searches goes very quickly. I also understand that you want to give people incentive to upgrade but I would suggest that perhaps 50 might be a better number. I don't know Kyle... back when Gold membership had 200 searches, I managed to use all those up in 2 days. I personally think 40-50 would be a better number. It may take some people 10-15 searches before they get the right idea on what sort of keywords they should be looking for. Cool, thanks for the feedback as well Luke. We are definitely going to sifting through data here to see how people are using the system. This is excellent. I think this is a great move on WAs behalf as I've seen a lot of people struggle trying to figure out if this is for them in just 10 days. Great news Kyle and Carson! Hey Luke! Was wondering when you were going to chime in and I'm glad you did. We have always been advocates of building REAL businesses online and we have an outstanding platform to deliver training to help people get started. However, 10 days was not long enough to truly get started so many people were forced to leave. Leaving WA is something we will not have to worry about again! Haha thanks Carson! I really need to start getting my Internet Marketing side of THD sorted out will this wicked news you guys have just... SPRUNG on us! Domain is sorted, That Marketing Dude will be making an appearance in the near future! That Helpful Dude will become a big name in the future and I hope to see you guys at the LA conference relatively soon! One quick question... Does this mean that premium members will get "demoted" to free members if they cancel their payments? I'm off traveling next year for a year. I'm playing on getting the annual membership before I leave but incase I'm not home before my membership runs out, I want to know if I can still get access to my account. Yes, premium members will eventually get demoted. That is the plan, but they will also lose everything that they had acccess to as premium members (if they were over the 2 domain limit, all premium accesses, etc). The premium features are going to continue to grow and grow...lots of awesome stuff coming as well. Excellent! It's nice to know. Serendipity at it's finest. Glad that this came at the right time for you and I look forward to working with you for the long haul! Wow. You guys just cant seize to amaze me. This is really awesome. Just yesterday I was telling someone about the 10 days trial period and she was like in order to maximize the use, she needed to clear out her diary. Now I can tell her there is not reason to do that. This is great news. Yeah, removes any complications like this. Now you can just tell people to join the community here and not worry about any trial period. Access the community for as long as you want, build websites, network, hang out, get help...it has completely taken any selling out of it. Wow, this is awesome. I had to check the calendar to make sure that it wasn't April 1st. I see that the Video Database is included with the Starter Membership but the Live Weekly Video is only available for Premium members. Does this mean that the live WAbbys are only available to the Premium members and the recorded WAbbys are available to all? There will be a backcheck to only permit Premium members to attend the live events? Both the live events and the recorded WAbby's are part of the premium membership and are currently only available at the Premium level. However, we have plans to unlock a handful for Starter members to see. This way everyone will have a chance to see how valuable the experience is with the live training events. Good choice. I knew you were on top of it. thanks, David. I guess I am getting ahead of myself but is there any content, sales page, etc that I just haven't gotten to in the training? If so I'll just keep reading. Yes definitely keep reading the training and follow the actions plans. You would need to create your own content to drive traffic from your site to WA for them to sign up. They will sign up based on your work. You will see how everything works as you get more into the training. Jump in the chat if you have any questions. Hi This does sound like great news! I have just started to learn the ropes about how to make money online and I know there are a lot of scams. I did purchase a few domains from outside web hosts. (Mainly to get the .com domain with my daughter's name.) The initial costs were very cheap, but the add-on's they try to sell you can add up substantially. THIS IS BEFORE YOU'VE MADE A PENNY! I will gladly buy the premium membership ONCE I am making $47.00 per month from my websites. Is this an unreasonable expectation? This sounds perfectly reasonable to me :) We have over 500 training tutorials here at WA that members on a Starter account can learn from. Since you have a couple of domain names already, now you can host them here at WA and make use of the WordPress Express website builder to build the sites! This is awsome . This offer will increase online community . If I sign up as a premium member, I assume I am an affiliate and can earn $$$ from referrals I sign up, got that part, do I also get an affiliate site that promotes Wealthy Affiliates or do I need to create my own site. You would create your own site but you could create it here using site rubix or your own domain. Wow is a good place to start! I thought I read this thing wrong the first time. This is very exciting news indeed. You guys are making some great changes to WA or rather improvements. Can't wait to see what's next! You read it right Ty! I know I always say this, but this is just the start (and it truly is). We always have exciting stuff planned and the rest of this year and early 2013 is going to prove to be some of the more exciting months yet! Wow! This is really awesome! Makes it a lot easier now to promote WA. You are the most generous internet marketing rockstars I've ever met. Yeah, for sure. It has never been an easier sell and you can feel really awesome about the fact that you have let people know about the community here. Instead of "join here but you only have 10 days" it is, join me here within the online business community where I train/teach and get free websites, etc...."
Well Carson, Kyle you have done it again. You took something amazing and made it even better. Can that even be done? Well, you did it. You already know how I feel about Wealthy Affiliate. Now thousands more can benefit from the same training center that helped train me and gave me the tools to make a serious business out of this knowledge. Thanks David, as always appreciate your feedback! This is a point we have wanted to be at for quite some time and it has always been part of our vision. We have a very exciting vision ahead and it includes all members here at WA (and it is to benefit all of them). Good business model guys. I can not wait to see where you take this. Thanks Shawn, we're super excited about this and the opportunity it presents to everyone. Time allows new people to immerse themselves and actually get started in building their business - no pressure to try and start a business in 10 days. For Premium members... on top of having absolutely everything at your finger tips, we have so much more in the works! Can't wait!!! This is awesome...I only found you today and have my site set up, however, I have many contacts that this will be a blessing to because they work out of the home so this will give them time to get things done. AND if you are a real newbie it could be harder to put things together. I had worked with online marketing, SEO, WP sites, etc., so it was really easy for me to follow direction. Someone new, might not be so easy. I am sure I will feel at home here very soon! Thanks! I will get the word out about you all. I wanted to make sure I knew what I was doing before I introduced it to others because I knew the time constraint would be hard for some! :) Have a GREAT night! Hi Joyce (Nana), welcome to Wealthy Affiliate and thanks for the comment :) As you get started with your training we always encourage feedback. If you get stuck on anything we would love to hear about it. One of our most challenging ongoing tasks is to help people of all experience levels and backgrounds understand how Wealthy Affiliate wil benefit them, and how to get started with their training. All feedback that we receive helps us improve! Also, it's awesome that you know some people who could benefit from WA. I look forward to meting them too. Quick question, is 2 websites two siterubix domains or two of there own domains? This is momentous..This is going to be an amazing and unequaled value-ladden service to your members of both levels.. You guys are indeed honourable, a rare quality in this online world of super money grabbers & client fleecers.. You've worked tirelessly for the successes you have achieved, And are giving back to the community in the biggest way possible, through the lucky few of us who have been lucky enough to be part of this already Amazing WA community. We definitely are living in the land of 'Hope'. It'll now be up to us to pick the hanging fruits and excel..:) Thank you Kyle & Carson.May You Stay Forever Blessed. Thanks for the nice words and encouraging feedback Rea! A big part of what Kyle and I do on a daily basis is try to lay to rest the belief that everything online is a scam. Unfortunately, in the online business industry there is just scam after scam and that causes an uphill battle for us. 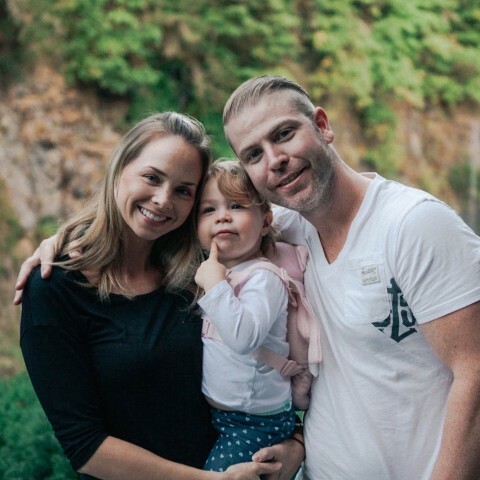 The members at Wealthy Affiliate have always been our motivation and this milestone will hopefully allow many more people to call WA their home base for learning, tools, and networking. Again, thanks for the feedback and for motivating us! Great idea as 10 day's isn't a long time, specially if you only have an hour or so per day top work at this opportunity. So do the Starter members have access to the live chat like the 10-day trial-ers did? I honestly think the live chat is one of my favourite things here. It was what drew my attention to make the decision on joining, nothing more attractive online than live help. is there gonna be any new shout outs added to start promoting this to get new people in on this HUGE extravaganza? there hasn't been any since march, i just looked. march 26, 2012 to be exact. you guys really outdone yourselves with this update...awesome job :). This is awesome!! It takes the pressure off of those that are new and feel so overwhelmed when they get here. It's so much to take in and when you are literally brand new to Internet Marketing and online business it can actually leave you kind of depressed and rushed. What a great way for those that are new to take their time, get to know the people at WA, get their feet wet, questions answered, build relationships and start seeing success. I believe that the "new" people who have not joined the Premium membership will see the value of this and join! GREAT idea guys! Thanks! Now all "new" people to Wealthy Affiliate can take their time, immerse themselves into the community and learn at their own pace. Premium level membership makes a lot of sense for all that are serious about taking their knowledge to the next level, but getting a good base of knowledge first is now possible! This is amazing. I pushed hard to figure out whether or not I wanted a premium by the end of my first 10 days here. It'll be interesting to see people take their time and not stress about jumping in. Because I know this would be a bad investment for those who want to do it but don't have the time. Hey Nick. 10 days just ins't enough time for people to realize the benefits of Wealthy Affiliate. There are so many aspects of the system that you can benefit from. Kyle and I know that there is no other place on the net is better than WA for learning, building, and networking in the Online Business realm but we have had 7 years to realize this where up until now people only had 10 days. We want everyone to make the right decision for themselves. Upgrading to Premium will open many doors that are not available anywhere but the Starter membership its self will help spark many successful businesses. Wow!! Truly an Amazing opportunity for ALL !!! It absolutely is. Now people can truly focus on what they want to do without any distractions of a 10 day trial and they can work as their schedules permit. We have been excited about getting to this point for quite some time and today is officially the day! Hey James, the opportunity is most certainly one that everyone can take advantage of. With each day that passes we are working in the background to take "Amazing" to a whole new level! I really do look forward to getting to know you and work with you here at WA. I look forward to getting a chance to work with you! Great idea. This should help new members that were having a hard time getting started! One of the biggest problems people faced at Wealthy Affiliate when we offered only 10 days as a trial was being able to get started. Our goal has always been to reach out to every single person that we can, but the 10 day trial didn't allow us to do that. Now that the Starter membership does not have a time limit we hope that every single person that comes into WA will call it their home for online business and start working through the outstanding training that is available to Starter members. Thanks for the comment! WOW! Thanks Kyle and Carson, you guys ROCK! This is really it. This is a reality and this is going to be benefit all membership levels here at WA! The future is very BRIGHT ahead for members within the Wealthy Affiliate community, both Starter and Premium members! For Kyle and I, today is monumental to the success that people achieve within the WA community. It is a milestone that we have had as part of our goals and the removal of the trial time limit will allow us to push forward with some absolutely industry changing upgrades coming to WA very soon. In the coming weeks, months, and well into next year we have endless updates planned that will create even more space between the Wealthy Affiliate community and anything else out there!